The Board of Psychologists makes every effort to include on this website all relevant information pertaining to the licensing and regulation of psychologists, behavior analysts and assistant behavior analysts in Montana. Beginning March 1, 2019, the Montana Department of Justice will be increasing the fee for a Federal Fingerprint-Based Check to $30.00 for background checks conducted for pre-employment, employment, and licensing purposes. The background check and fee includes the Montana WIN check, as required by the FBI. Statutory authority is required to conduct these checks. Please contact the Montana Department of Justice at (406) 444-3625 for more information regarding this upcoming fee change. a rigorous oral examination administered by the Montana Board of Psychologists, also focusing on the applicant’s competency in psychological assessments. Consumer Note: In Montana, only licensed psychologists are required in this way to demonstrate their competence to conduct, interpret, and analyze psychological assessments. Other professionals describing their work as “psychological assessments” are not subject to similar requirements to establish their qualifications. Board meetings are usually held several times a year. Meeting minutes are posted within 3 days of board approval. In general, Board meetings are open to the public. There are certain meetings or parts (Screening Panel and Executive Session), which are closed to the public. Board members are appointed by the Governor with Senate confirmation. A member may serve two consecutive 5-year terms. Individual Board Members can be contacted by email at dlibsdpsy@mt.gov. In your message please specify which board member you would like to contact. For additional contact information and information on board member terms, please visit the Governor’s Office link for Board Members and Councils at http://boards.mt.gov/. Applying for a new license? To use a paper application form, click the “Forms” tab and then use the link to “License Application Forms.” Then select your form from the choices shown. To apply for a license using the online application process, please use the "Apply for a License" Quick Link in the upper right-hand portion of the page. Want to confirm a person is licensed? You can learn who is licensed in Montana through Licensee Lookup or by contacting the Board. Want to order an official verification to send to another state or entity? Licensees may request a written, official license verification by submitting a license verification request form and a $20.00 fee. The following outlines general license information. For specific information on filing an application, you will need to obtain the checklist which includes a detailed listing of the requirements. Doctoral degree in psychology from an accredited college or university and has completed a course of study meeting minimum standards specified in the Board's rules ARM 24.189.604. To determine whether a course of non-APA accredited study meets the minimum standards in Board rule ARM 24.189.604, applicants shall have their educational credentials evaluated by the National Register of Health Service Providers in Psychology (NR) www.nationalrgister.org. The fee required for this service shall be paid by the applicant to NR. Psychologist Licensed by Experience (Senior): Doctoral Degree. 2 years of supervised experience, 1 of which must be postdoctoral but may not include more than 6 months of supervised research or teaching. Licensed to practice psychology in a United States or Canadian jurisdiction for 20 years or longer; at least 10 years of clinical experience in the last 15 years prior to filing the application. Psychologist: National written exam and pass oral exam given by the Board. Active Renewal Fee is $600. Late Renewal Fee is an additional $600 for a total of $1200 to renew. No exceptions! Postdoctoral supervision obtained in Montana must be approved by the Board. Montana postdoctoral supervises must keep a supervision log per ARM 24.189.607. Applicant has not been subject to any disciplinary action during the entire period of licensure. The following outlines general license information. For specific information on filing an application, you will need to obtain the appropriate behavior analyst checklist or assistant behavior analyst checklist which each include a detailed listing of the corresponding requirements. B. Continuing Education Requirements: 10 continuing education credits, of which one hour must be ethics, during each consecutive calendar year. Behavior Analyst renewal fee is $600. Behavior Analyst renewal supervision fee, per behavior technician, student intern, or assistant behavior analyst supervised $25. Late renewal fee is an additional $25 per behavior technician, student intern, or assistant behavior analyst supervised. No exceptions! Assistant behavior analyst license renewal fee $200. Late renewal fee is an additional $200 for a total of $400 to renew. No exceptions! This site is a primary source for verification of license credentials. The Montana Department of Labor and Industry, Business Standards Division, presents Licensee Lookup information as a service to the public. The Division relies upon information provided by licensees to be true and correct, as required by statute. It is an act of unprofessional conduct for a licensee knowingly to provide erroneous information to the Division. The Department of Labor and Industry makes no warranty or guarantee concerning the accuracy or reliability of the content of this website. Assessing the accuracy and reliability of information obtained from this website is solely the responsibility of the user. If you have questions regarding information found within this Licensee Lookup website, please contact the specific licensing board directly. Please note that some disciplinary actions against licensees may not appear immediately on the website. Appeals, effective dates of orders and other administrative processes may delay posting on the website. Please contact the specific licensing board directly if you require discipline information that occurred prior to July 1, 1996. This service allows you to purchase complete lists of individuals, businesses, and contractors licensed with the State of Montana through the Business Standards Division. Renewing a License? Don't wait until the last day! It is your responsibility to renew on time. Renewals made after the expiration date will be subject to a 100% penalty under Department rules. If your mailing address has changed, please use the "Change Address" Quick Link in the right-hand frame to access a change of address form. This will assure that you receive timely information about your renewal. Late fees: Renewal after a license's expiration date will automatically result in a 100% late fee, in addition to the renewal fee. Please renew your license on time to avoid additional fees. All of the Statutes and Rules listed here are applicable to this board. Statutes are laws passed by the Legislature. All changes in statutes must go through the legislative process and be passed into law before they become effective. Title 37, Chapter 1, Part 3 is the Uniform Regulatory Act passed by the Legislature in 1995. All professional and occupational licensing is covered in these statutes. Administrative Rules pertaining to psychologists are written and adopted by the Board of Psychologists. The Board writes rules in order to administer the laws over which the Legislature has given the Board authority. Rules can be changed by going through the rule-making procedure. They do not go through the Legislative process. The Board of Psychologists continuously reviews rules to determine needed changes. The Administrative Rules of Montana (ARM) at this site contain what should be the same text as the official version published by the Office of the Secretary of State. There is a possibility, however, that the content may vary from the official version. In addition, the format has been changed for viewing on this web site. A copy of the official ARM in official format can be obtained from the ARM Bureau of the Office of the Secretary of State, by emailing SOSARM@mt.gov. A web version of the ARM published by the Secretary of State can be viewed at Secretary of State's Administrative Rules of Montana. The mission of the Board of Psychologists is to protect the health, safety and well-being of Montana citizens through the licensing of competent psychologists and by the regulation of the practice to promote the delivery of quality health care. In meeting its mission, the Board takes appropriate action for unprofessional, incompetent, or unlawful practice. The Department is charged with regulating professions and occupations for the protection of the public as a whole. Although the Department does not represent individuals filing complaints, the Department will review complaints in a timely manner to ensure a complaint is processed and that the Board will take appropriate action. The length of time for resolution of a complaint is impossible to estimate due to the various complexities presented in individual complaints. Unlicensed practice of the profession or occupation. If an individual is unsure of what constitutes unprofessional conduct and needs a description of the various types, reference to Montana statutes and rules will provide an answer. These are found at your local public library or at the appropriate board site on this web page. "Name of the Board or Program the complaint pertains to"
This process is used for the Boards that are administered in the Business Standards Division. The various Programs administered in the Division use a similar process. When filing or responding to a complaint, be as thorough as possible. You may attach additional documents to the complaint form to ensure that all pertinent information has been included. The Screening Panel meeting is NOT a hearing, but is a time for the panel to consider the complaint and response. Attendance is your choice. If you attend the panel may ask additional questions. Please notify this office prior to the meeting if you plan to attend. The Compliance Office will send a letter of acknowledgment to the person who filed the complaint (Complainant), and a letter requesting a response (with a copy of the complaint) to the licensee against whom the complaint was filed. The Licensee may submit a written response addressing the complaint to the Compliance Office. The process continues whether or not a response is submitted. The Complainant is not entitled to a copy of the response. The Compliance Office will notify the Licensee and Complainant regarding the date and time of any meeting during which the case will be discussed. Complaints remain confidential unless a Notice of Proposed Board Action is issued, which is a public document along with all subsequent legal filings. Closed Meeting - During a Closed Meeting only the Licensee, the Complainant, and/or attorneys for either can be in attendance. Minutes of Closed Meetings are not public documents. Open Meeting - A public meeting which anyone can attend. The minutes of Open meetings are public documents and made available online via the specific Board’s webpage. Individuals may attend a meeting in person or by telephone. Please notify this office prior to the meeting if you plan to attend the meeting. Screening Panel: A committee comprised of members of the Board. The Screening Panel’s function is to determine the preliminary action(s) to take on a complaint. Possible preliminary actions include dismissal, investigation, or a finding of Reasonable Cause. The complaint and response (if any) are submitted to the Screening Panel members. The Screening Panel meeting is not a hearing, but rather a committee meeting to review and discuss the complaint and response to determine if disciplinary action is warranted. If the Screening Panel dismisses a complaint, the complaint can be dismissed with or without prejudice (see definitions below). Dismissal With Prejudice - The complaint is dismissed and cannot be considered by the Screening Panel in the future. Dismissal Without Prejudice - The complaint is dismissed but may be considered by the Screening Panel in the future if there are ever allegations of a similar nature. Only a member of the Screening Panel can request an investigation of a complaint. If an investigation is requested by the Screening Panel, the case is assigned to an investigator who may request an interview with the Licensee, the Complainant, and/or other individuals. Upon completion of the investigation, a written report is submitted to the Screening Panel, which will then determine if there is Reasonable Cause to proceed with disciplinary action. Reasonable Cause - A finding by the Screening Panel that evidence exists that a violation of statutes and rules has occurred which warrants proceeding with disciplinary action. If Reasonable Cause is found, the Department Counsel issues a Notice of Proposed Board Action (Notice) to the Licensee. Once a Notice is issued, it is public information. A proposed Stipulation may be included with the Notice. Notice - A legal document from the Department’s Legal Counsel which sets forth the Department’s factual assertions, the statutes or rules relied upon, and advising the licensee of the right to a hearing. Stipulation - A tentative agreement for settlement of the case. A Stipulation is not finalized until approved by the Adjudication Panel. The Licensee may either sign the Stipulation or contest the proposed action by requesting an administrativeHearing (a legal process before a Hearing Examiner). If the Licensee wishes to request a hearing, written request must be received within twenty (20) days from receipt of the Notice. Failure to either sign a Stipulation or request a hearing within twenty (20) days may result in the issuing of a Final Order of Default against the licensee. Adjudication Panel - A committee comprised of members of the Board who are NOT on the Screening Panel. The Adjudication Panel determines the final outcome of a case. The Adjudication Panel reviews the record to determine appropriate sanctions. A Final Order is issued by the Adjudication Panel, completing the complaint process. A copy of the complaint and a request for a written response are mailed to the person against whom the complaint was filed (Respondent). The respondent may submit a letter of response to the complaint. If a written response is not submitted, the complaint process continues without a response. The complainant and the respondent are sent written notification of the date, time, and location of any meeting at which the complaint will be discussed. Unlicensed Practice complaints are addressed by the Full Board in executive session (meaning closed to the public). Board meetings are open to the public unless the chairperson determines an individual’s right to privacy outweighs the public’s right to know. If so, that portion of the meeting will be closed to the public (only the respondent, complainant, and legal counsel for each (if any) may be present). The complaint and response (if any) are provided to the board members prior to an upcoming board meeting for their review. The board meeting is not a hearing, but rather a meeting at which the information provided is considered and discussed by the board. If the board dismisses a complaint, the complaint can be dismissed with or without prejudice. Dismissal With Prejudice-The complaint is dismissed and cannot be considered in the future. Dismissal Without Prejudice-The complaint is dismissed but may be considered by the board in the future if there are ever allegations of a similar nature. The board can request an investigator be assigned to gather additional information surrounding the allegations made in the complaint. This may involve interviews with the respondent, the complainant, and possible witnesses. After the investigation has been completed, an investigative report is prepared and presented to the board for consideration at a subsequent meeting. Following the board’s review of the investigative report, a determination is made to either dismiss the complaint or take action in the form of a Cease and Desist or an Injunction. The board may issue a Cease & Desist or seek an Injunction. Cease & Desist–A letter from the administrative agency prohibiting a person or business from doing or continuing to do a certain activity. Injunction-A writ granted by a court prohibiting a person or business from doing or continuing to do a certain activity. 1). Licensees for any profession can be verified by using LicenseLookup.mt.gov. This website provides real-time connectivity to the Business Standards Licensing Database. There is no charge for this service. 2). An individual may request licensure information directly from the board or program email link. The email should include first and last name, address, city, state, license number and any other type of identifying information. There is no charge for this service. A response should occur within 3 days of receipt. 3). To request an official license verification be sent to another state licensing board, jurisdiction or individual for license confirmation status in the State of Montana. The fee for this is $20.00 per verification requested. Once the fee and official license verification form are received, the request will be processed and mailed within 5 days. For many years the Congress of the United States has worked diligently to protect the health and welfare of the nation's elderly and poor by implementing legislation to prevent certain individuals and businesses from participating in Federally-funded health care programs. The OIG, under this Congressional mandate, established a program to exclude individuals and entities affected by these various legal authorities, contained in sections 1128 and 1156 of the Social Security Act, and maintains a list of all currently excluded parties called the List of Excluded Individuals/Entities. Welcome to the Frequently Asked Questions section of the Board of Psychologists website. This section has been expanded so that more of your questions can be answered. The Board of Psychologists is pleased to bring you “eBiz,” its web-based system for licensing, renewals and licensee information. Change personal contact information such as mailing address. “eBiz” is also the new home for the Department of Labor and Industry’s “Licensee Lookup” service. Note: Licensee Lookup does not require a User Name and Password. It is free and available to the public. How do I get my User Name and Password? When you register with eBiz, you will choose a User Name and Password that you can then use to conduct business on the website. Once you have a User Name and Password, be sure to keep them in a place where you can easily reach them for license renewals or other online business with the Department. If you don't know your User Name and Password, contact the Board office by e-mail at dlibsdpsy@mt.gov and your information will be sent to you. How can I print my own license? Once you're in, look to the lower left and find the "Health Care Licensing" blue box. When the screen refreshes, click on your license number. On the next screen, scroll down until you see a bar that reads "Print Your License"
Click on that bar--your license will come up and you can print it or click on the "Page" tab and you can save it to your computer. How do I find license / discipline information about a licensed individual? You can go directly to the Licensee Lookup System. This public service is part of the Business Standards Division’s “eBiz” website and is a primary source for verification of license credentials. The Division relies upon information provided by licensees to be true and correct, as required by statute. It is an act of unprofessional conduct for a licensee knowingly to provide erroneous information to the Division. The Department of Labor and Industry makes no warranty or guarantee concerning the accuracy or reliability of the content of this website. Assessing the accuracy and reliability of information obtained from this website is solely the responsibility of the user. If you have questions regarding information found within this Licensee Lookup website, please contact the specific licensing board directly. Please note that some disciplinary actions against licensees may not appear immediately on the website. Appeals, effective dates of orders and other administrative processes may delay posting on the website. Please contact the specific licensing board directly if you require discipline information that occurred prior to July 1, 1996. Look for the blue box labeled “Licensee Lookup” and click on Search for a Licensee. When searching, use the licensee’s name. It’s the easiest way to search. How do I change my name on my license? Name changes must be requested in writing with documentation of the name change included (marriage license, divorce decree etc.). Licensees are required to notify the Board of a name change within 30 days. Once the change has been made on a license, the licensee may access and print the revised license using the " ebiz" website. You can go directly to the License Lookup System. This site is a primary source for verification of license credentials and provides discipline information. 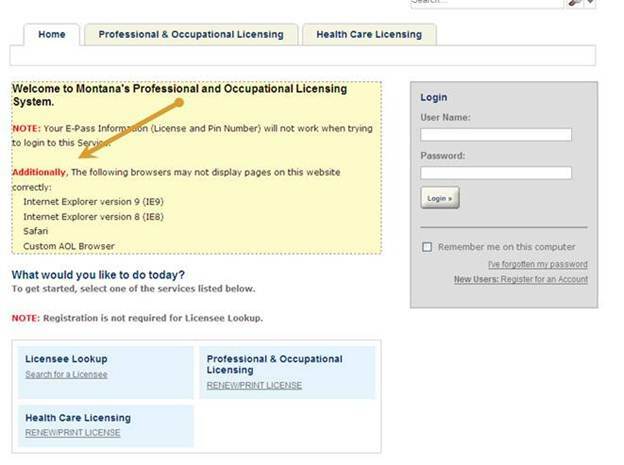 The Montana Department of Labor and Industry, Business Standards Division, presents this real time licensee lookup information as a service to the public. The Department of Labor and Industry makes no warranty or guarantee concerning the accuracy or reliability of the content of this website. The Division relies upon information provided by licensees to be true and correct, as required by statute. It is an act of unprofessional conduct for a licensee knowingly to provide erroneous information to the Division. Assessing the accuracy and reliability of information obtained from this website is solely the responsibility of the user. If you have questions regarding information found within this licensee lookup website, please contact the specific licensing board directly. Please note that some disciplinary actions against licensees may not appear immediately on the website. Appeals, effective dates of orders and other administrative processes may delay posting on the website. Please contact the specific licensing board directly if you require discipline information that occurred prior to July 1, 1996. Can I get a list of licensees in Montana? Yes, The Business Standards Division provides a service which allows individuals to download lists of licensees for a fee. To use the service, click on the “License Info” tab in the left-hand frame of this website and then look for the "Download List of Licensees" link. You can choose the license types, statuses and timeframe/geographical range you wish, and find out the cost. What do I need to know about Adminstrative Suspension? What is e-Pass? How do I use it? All on-line commerce functions for the State of Montana are now using e-Pass as an additional layer of security for business functions. More information on e-Pass. What if I can’t remember my E-Pass user name or password? The Board does not have this information. You will have to establish a new account with a new username. Please see Complaint Process FAQs. When will my license expire? Licenses expire December 31 for Psychologists, Behavior Analysts, and Assistant Behavior Analysts. How long is my renewal good for? Can I renew after the expiration date has passed? Yes. Immediately following the renewal deadline (the expiration date of the license,) an un-renewed license becomes “lapsed” and may be renewed, but with a substantial penalty for late renewal. A licensee may practice on a "lapsed" license for 45 days following the expiration date. Any license not renewed within 45 days following the expiration date becomes “expired.” An “expired” license may be renewed, but with a substantial penalty. Licensees may not practice on an "expired" license. If not renewed within two years following the expiration date, a license is “terminated” and dropped from the licensing database. It then ceases to exist. A licensee whose license has been “terminated” and wants to resume practice in Montana must apply for a new license. It is very important for every Board of Psychologists licensee to know the status and expiration date of his or her license. For that reason, keep your license certificate in a readily accessible place. How do I renew my license through “eBiz”? Professional licensees may renew their licenses online at https://ebiz.mt.gov/pol. Each licensee is assigned a personal User Name and Password to access the eBiz system. As your renewal period arrives, the Department will send notification to your address of record to remind you that it's time to renew. If you do not know your User Name and Password for online renewal, contact the Board by e-mail using the Quick Link in the right hand frame of this website. Will I be reminded that it’s time to renew? Yes, However, if you don't receive a reminder, it's still your obligation to renew the license on time. Please be aware of the expiration date of your license and the process to renew it. IMPORTANT NOTE: If a renewal notice is sent to an outdated address, the Board is under no obligation to send an additional notice to a new address. It is the licensee’s responsibility to make sure the Board has a current and correct address. NOTE: Board members and Department employees may not distribute any unofficial versions of rules to the public and must—emphasize MUST—refer the public to the Secretary of State website for the official versions of rules. How can I express my opinion about a rule change? Each Proposal Notice must contain information about how to submit a comment on the rules change proposal. In addition, a public hearing is held at the Business Standards Division where individuals can make oral presentations and submit written comment. Written comments are accepted in any form until a deadline date established in the Notice. All public comments are presented to the Board at a public meeting, at which time the Board responds to the substance of all comments received. How will I know when a new or amended rule is in effect? Once the Board votes to adopt a rules change, the Notice of Adoption is prepared and filed with the Secretary of State. The rule changes are effective the day after the final Notice of Adoption is published by the Secretary of State, unless otherwise provided by statute or stated in a rule. At that point, the rule is in place and enforceable. This also is when the Notice of Adoption is posted on the Board website and sent to interested parties who have requested to be notified. When can I see the actual new rule(s) in new, amended form? Not until the Secretary of State updates and publishes the ARM (Administrative Rules of Montana) with the amended rule(s) on its website and in hard copy. Because of the volume of work at the SoS and the nature of the rule publishing calendar, it may be several months between the Board’s adoption of new rules and their publication on the web. Until that point, the only way to assess any new rule is to compare the former version with the Notice of Proposal and Notice of Adoption. Board members, Board staff and other Department of Labor and Industry employees are prohibited from providing the public with a “clean” unofficial version of the new rule and must, instead, refer individuals to the Secretary of State website and the rule notices. Can I be held accountable for violating a new rule before it’s available in its final form? Yes. Once the Notice of Adoption has been published by the Secretary of State, the rule is enforceable, even though it is not yet published in its final form in the ARM. Let’s say there’s a new or amended rule that’s critical to my practice as a professional. If I must follow it—or hold others accountable to it—but it’s not yet published on the Secretary of State’s website, can I take the rule notices and make my own “clean” version of the amended rule and rely on that until the official version is published? The Board understands that licensees or other interested parties may be keenly interested in the final language of a new rule for multiple reasons, including their desire to comply with it or hold others to it. And while it discourages individuals from creating their own unofficial “clean copies” from the parts provided by existing rules and rule notices, the Board cannot prohibit individuals from doing so. Just be aware that no rule is truly “official” unless it is published by the Secretary of State (SoS). It is possible, if unlikely, that a rule might undergo a change during SoS review to correct typographical errors or resolve small deviations from standard rulemaking structure and language. Nobody should rely on an unofficial rule or distribute it to others. What subjects are covered on the Montana Oral exam? 1. Please ensure your submitted three work samples meet the requirements of ARM 24.189.610. The work samples should have your name and the number of the work sample (Work Sample 1, Work Sample 2, or Work Sample 3) at the top of each page and include page numbers. They must also be signed by both you and your supervisor (if you currently have one). All references to geographic subdivisions smaller than a state, including street address, city, county, precinct, and zip code. All elements of dates (except the date of the evaluation) for dates directly related to an individual, including birth date, admission date, discharge date, and date of death. The age of the patient should be retained. Telephone and fax numbers, email addresses, and Social Security numbers. Medical record or insurance plan numbers. How much continuing education do I need? Please see ARM 24.189.2107 CE Implementation for psychologists. What courses qualify for continuing education and what categories are they reported under? Please see ARM 24.189.2104 CE Program Options for psychologists. To establish documentation of a doctoral degree in clinical psychology equivalent to those of an (American Psychological Association) APA-approved program, applicants shall have their educational credentials evaluated by the National Register of Health Service Providers in Psychology, Inc. and approved by the Board. National Register The fee required for this service shall be paid by the applicant. How Do I Obtain A National Practitioner Data Bank (NPDB) Self-Query? The required National Practitioner Data Bank (NPDB) Self-Query can be requested by calling NPDB at 800-767-6732 or visit http://npdb-hipdb.com/ on the Internet. This form must be mailed directly to the address indicated in the instructions. The results will come to you; upon receipt, please forward them unopened to the Board office. Read and attest to reading the Noncriminal Justice Applicant’s Rights form (form is included in the application). Most local law enforcement agencies will take your fingerprints for a nominal fee. After paying this fee and having your fingerprints taken, send the completed fingerprint card along with a check or money order for $27.25 made payable to the “Montana Department of Justice” and mail it to Montana Criminal Records, 2225 11th Avenue, PO Box 201403, Helena MT 59620-1403. Please check with your local post office and add accurate postage prior to mailing. If DOJ rejects your first fingerprint card as “unreadable,” the Board office will notify you and you will need to re-submit your fingerprints. You are not required to repay the processing fee to the Montana Department of Justice under these circumstances. Criminal History Record Information (CHRI) from the fingerprints is only released to the Board of Psychologists. Your application will not be considered complete until the CHRI is received from the DOJ. Please see ARM 24.189.916 CE Implementation for behavior analysts and assistant behavior analysts. Please see ARM 24.189.919 CE Program Options for behavior analysts and assistant behavior analysts.